-High-quality hardware and synthetic PVC leather ensure unmatched durability. -Comes with a separate pouch and a detachable PVC leather shoulder strap adjustable up to 25?? drop. This is the perfect sidekick to any modern people. Organize your life and look stunning while at it, by clicking "dd to Cart" now! DESIGN: high quality classic design tote with detachable pouch; decorative string with logo; 1 sunglass a1 cell phone and 1 wall zipper pocket in pouch. ACCESSORIES: this cross body bag comes with 1 detachable crossbody strap adjustable up to 25" drop; 1 decorative string. 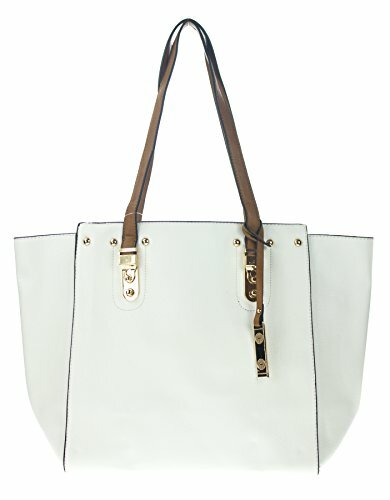 DIMENSIONS: Tote 18"Length X 12"Height(Not include handle) X 5.5"Depth; Pouch 12"Length X 9"Height X 5.5"Depth. If you have any questions about this product by CANAL, contact us by completing and submitting the form below. If you are looking for a specif part number, please include it with your message.